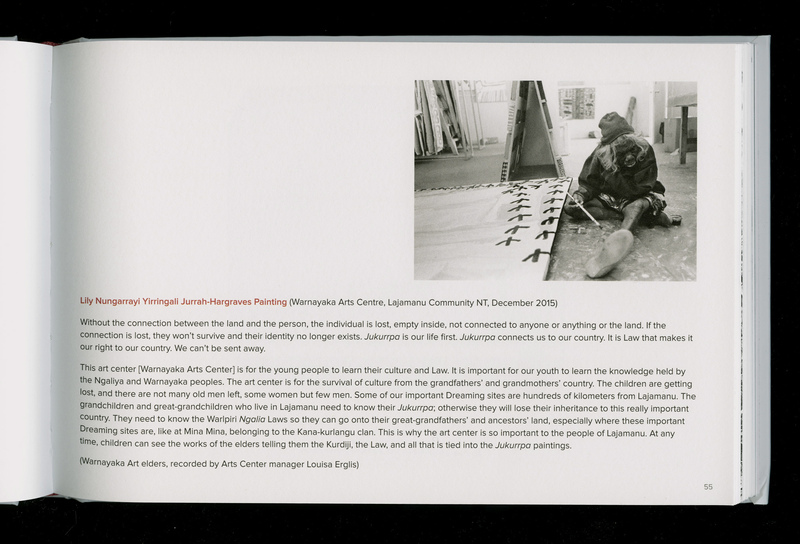 Warning: Aboriginal and Torres Strait Islander readers should be aware that the posting on this book contains images and names of people who may have since passed away. 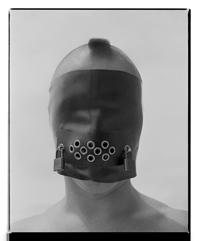 Unlike America, where social documentary photographers are well known, hardly a name from the above list (save perhaps Max Dupain and possibly Frank Hurley) would be recognised by a wider Australian public and there is little evidence or acknowledgement of their work in Australia. I believe that this is because social documentary photography has never been heavily promoted in this country and that this type of photography is a slice of many people’s work without becoming the driving force behind their oeuvre. 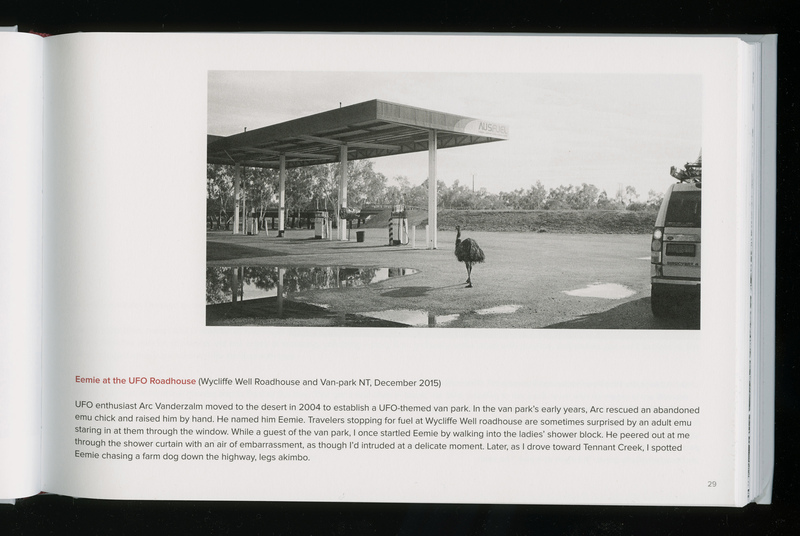 As my friend and curator Nick Henderson observes, “Perhaps the lack of visibility is in part due to many of the social documentary photographers undertaking work for the various state libraries, who regularly commission work documenting place – sometimes external, but also staff photographers – whose work is then not exhibited: many of the institutional galleries haven’t devoted much time to displaying and promoting that work.” While there may have been social documentary photographers in each country town and embedded within federal and state institutions, their work never seems to reach the audience it deserves. Into this amorphous arena comes a brilliant book Sydney based poet, photographer and composer Judith Crispin titled The Lumen Seed (Daylight Books 2016), a book of that addresses the stories of the Warlpiri people of Lajamanu through conversation, poetry, drawings and photographs, a book that should be compulsory reading for all Australians. I’m British and I have been here in Australia since 1986 and I have never understood the non-relationship Australia has with its Indigenous people. Growing up on a farm for the first twelve years of my life in England gives me some understanding of a life lived well on the land. We were working class poor, my mother having to boil water on a stove so us kids could have a bath in a copper on the kitchen room floor; and we lived on what we could shoot from the land – pigeons, pheasants, rabbits and hares – and we were acutely aware of the providence and blessings of nature for our sustenance. A totally different connection to land than an Aboriginal one, but a connection none the less, as I found out when I visited the old farm on a recent visit to the UK in August. Walking up the cart path where I had played as a kid brought all the magic rushing back… the flowers, the forest, the trees, the animals and the earth. The book needs to be tough to tell the true. But through poetry, love and light a new cosmology emerges that brings hope for a better future. Truth and consequence in red dirt country. 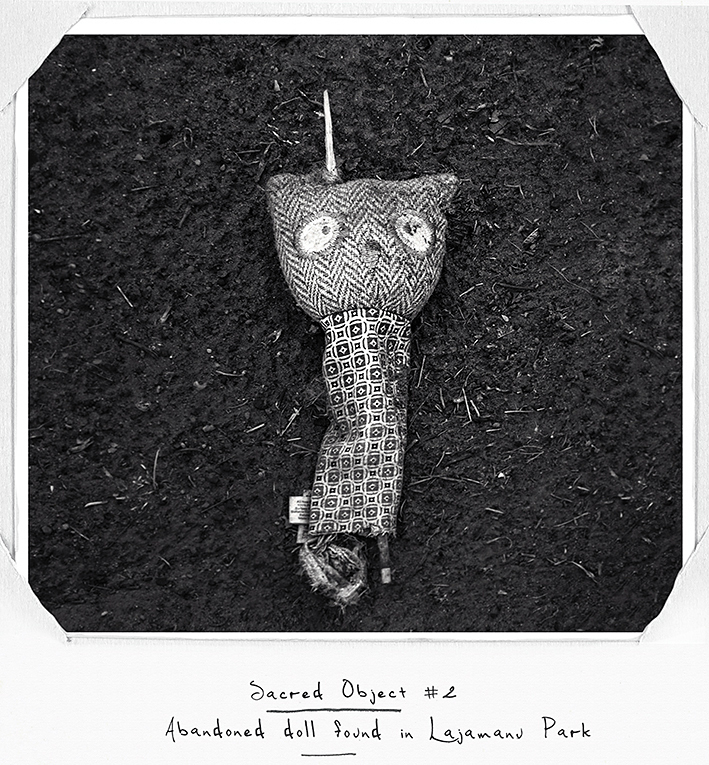 Many thankx to Myrtille Beauvert, Daylight Books and the artist for allowing me to publish the photographs in the posting. Please click on the photographs for a larger version of the image. 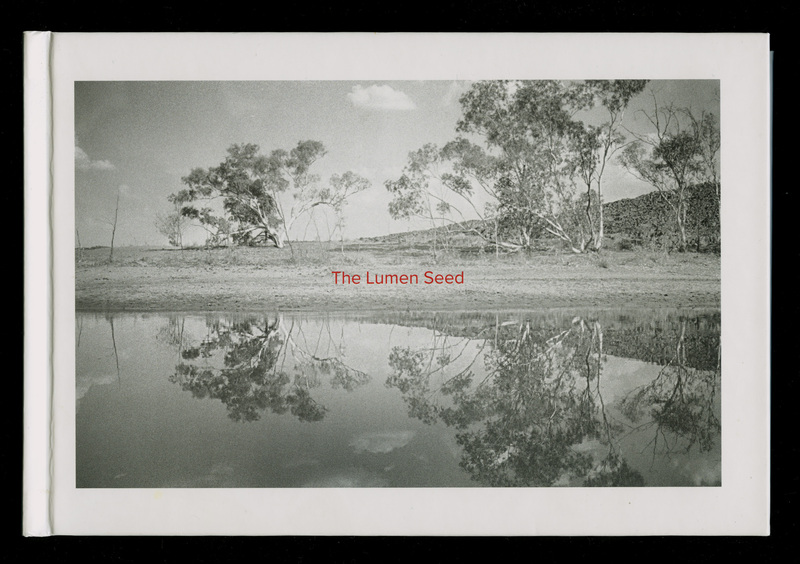 The Lumen Seed by Judith Crispin (Daylight Books), a cultural dialogue that is taking place before a backdrop of offences against the Australian continent, as well as a history of systematic discrimination against Indigenous peoples on the part of the country’s white population. “The Lumen Seed is a tough and powerful work. 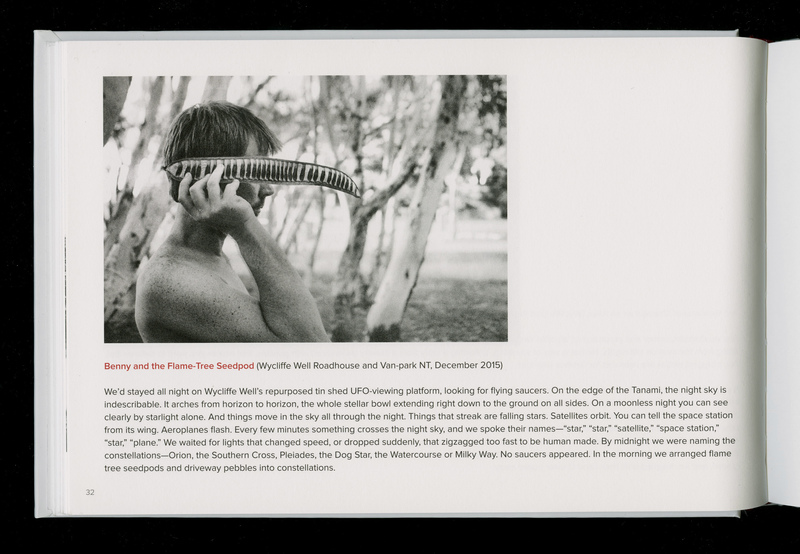 In photographs, narrative texts, drawings, and poems it sings stories of the Warlpiri at Lajamanu at five minutes to midnight. Who will hear, who will see, who will act? There is nothing like twilight in red dirt country – the soft crackling of fire warming your billycan as the Seven Sisters begin their dance across the night sky. Or the camaraderie around a campfire as people speak in their indigenous languages – the women making jokes about the day’s goings-on or about mistakes made in the intricate protocols of a Law you are learning, day by day. Everything that lives has meaning here. Upholding knowledge is a lifelong obligation for First Nation Custodians – not only in the present but into the future. How can we Australians know this land or our place in it, if not through relationship with our hosts, the Aboriginal people? 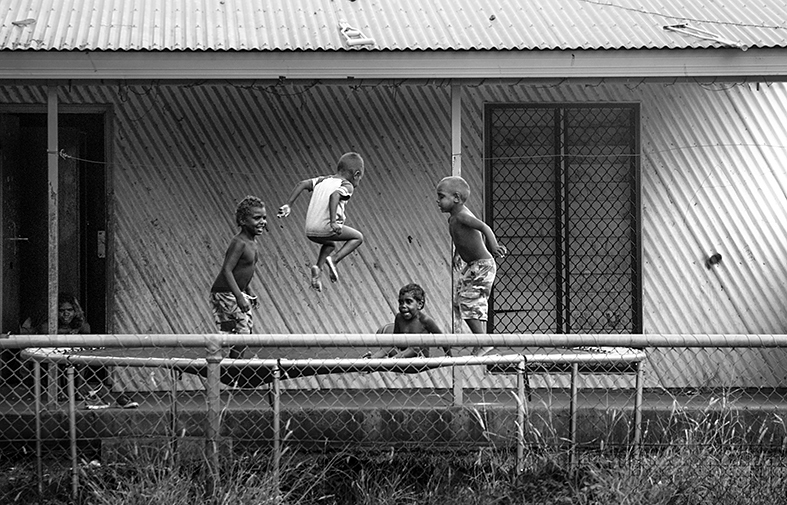 When inviting me to write this foreword, Judith Crispin explained her choice, saying, “You are uniquely positioned, as Australia’s premier and longest-serving photographer who has worked collaboratively with Aboriginal people in communities around the country making their culture and struggle for justice visible.” Truly, in both a professional and a practical way, I know the difficulties and the deep satisfactions of working in community. I understand the privileges of learning about the Law, the reciprocity of gratitude, and the obligation to stay true to the received teaching over a lifetime. As a photographer of long experience, with friendships in Aboriginal communities, I know how everything depends on one’s openness to experience, on the give and take inside relationships that informs how one sees and feels. Photographers in this tradition work in slow time. You learn to move with the people, move within the rhythm of their days, within their country, their wind and sky. What is learned through these relationships can change how one sees forever. By invitation, we become messengers from the frontier of interpersonal experience, conveying urgent messages from our teachers and hosts. 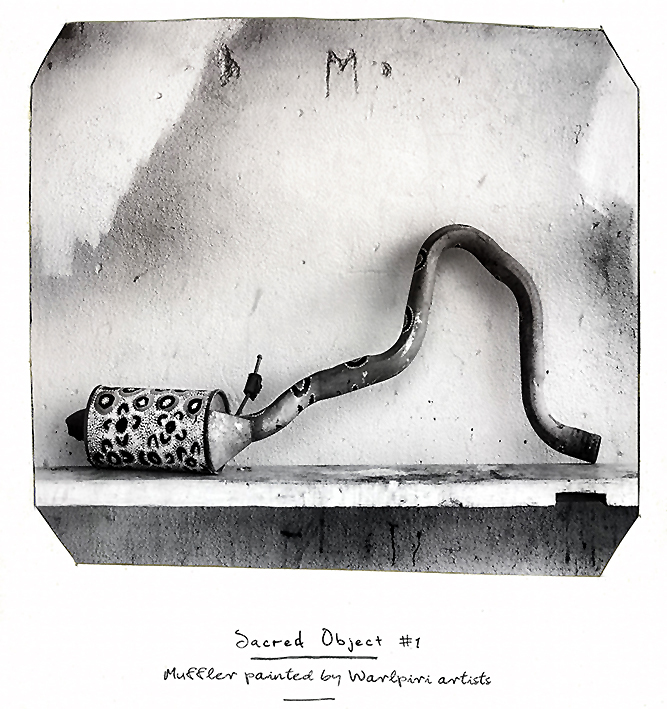 Into this collaborative tradition of relational interpersonal documentary photography – which began with the work of committed photographers in Australia during the 1970s – now steps Judith Crispin with her important book about magic, knowledge, and history. She relates teachings of the Law men who adopted her, who gave her the skin name Nangala, a name that defines her relationship to everyone in the community. In this way, she is being “growed up,” learning how to see the universe according to Warlpiri Law. The Lumen Seed opens onto an apocalyptic scene. 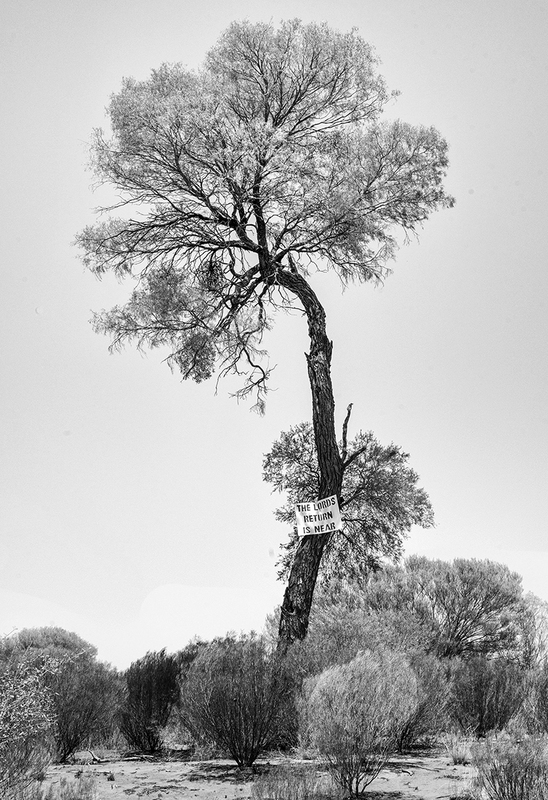 A hardwood mulga tree, reaching for the sky, holds a placard: “The Lord’s Return is Near.” In Coober Pedy, a curved handmade house rendered in warm mid-tones is edged with the sign “Welcome to Nowhere.” Dusty desert roadscapes unfold into the giant sacred stones of Karlu Karlu. 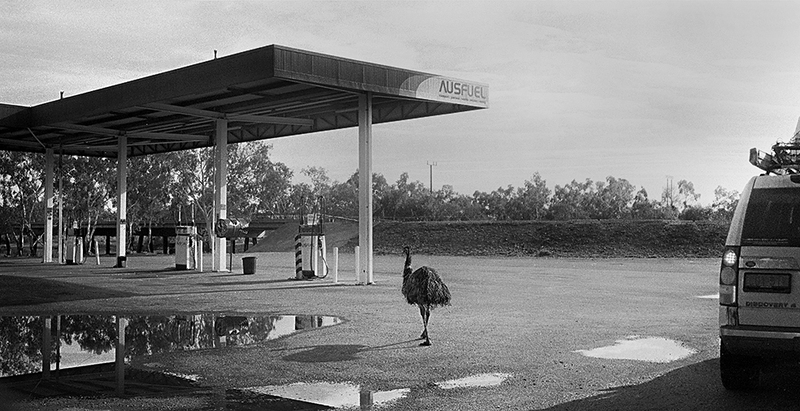 An emu wanders nonchalantly into a gas station. We’re in Emu Dreaming Country now, meeting Crispin’s traveling friends. Foreword extract by Juno Gemes, Hawkesbury River, April 11, 2016, pp. 6-7. In late 2015 I was diagnosed with cancer. Before then, I’d not understood how five words could change everything. “I’m sorry, Judith,” my doctor told me, “it’s cancer.” It’s a cliché that you only learn to value life when death is walking beside you, but it was absolutely true for me. I remember driving over Clyde Mountain to bring the word cancer to my parents’ home. Every tree on the range seemed invested with vital force. Every leaf was vibrant, iridescent. Gray mountain gums, in headlights, seemed to manifest ancient intelligence – bearing witness to the fleeting existence of human beings. The threat of death reminds you how precious people are – your oldest friends, children, lovers, parents – you wonder how you’ll bear to leave them. There is a particularly miraculous vision of the world that comes only with the diagnosis of serious illness. 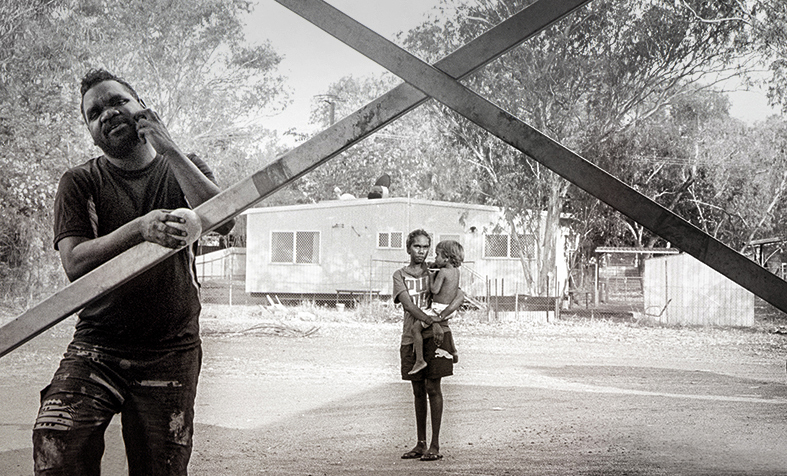 The earliest photographs in this book were taken in 2013, when I still believed the Warlpiri needed my help – to promote literacy and health, to outline positive pathways toward reconciliation, and so on. 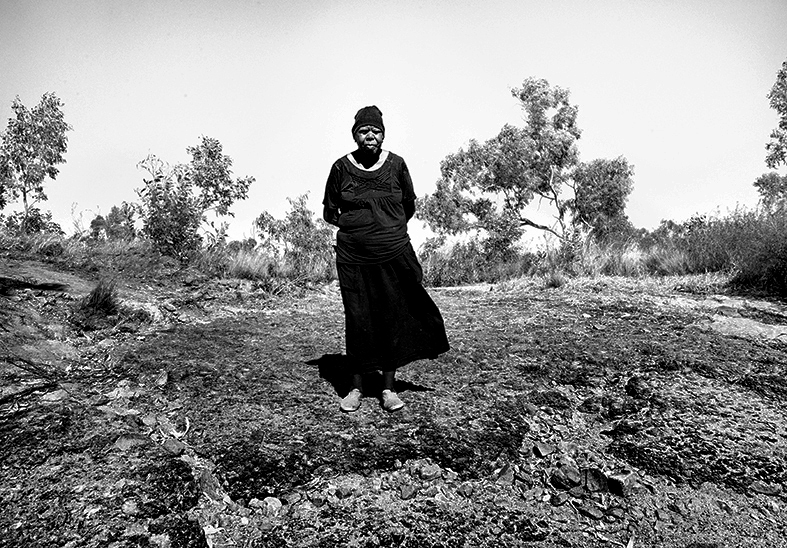 The later photographs were taken in December 2015, when I knew, without a shadow of doubt, that I was the drowning woman and the Warlpiri were the lifeboat. 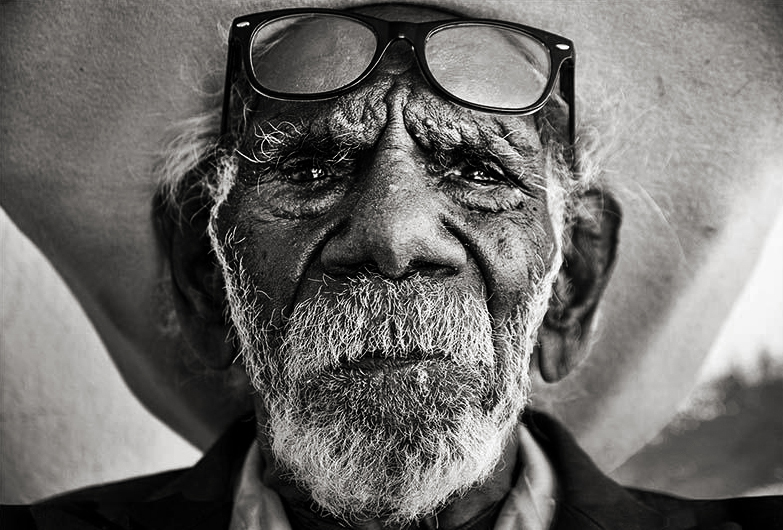 Lajamanu’s elders, especially Wanta Jampijinpa, Henry Jackamarra, and Jerry Jangala, were kind to me. They gave me a skin name1 and showed me how to be a “policewoman” for Jdbrille Waterhole. They seemed genuinely delighted by my interest in Warlpiri cosmology, which they illustrated with stories and drawings – some of which are reproduced in this book. The older women took me “hunting” for wattle seed and bush potato. They told me stories of covenants entered into with ancient star-beings and showed me places along the Tanami Track where min-min lights had chased travellers. Fairy tales and mysteries take on new importance when your life feels precarious. Lajamanu in 2016 is a meeting of two universes. Elders check their Facebook status on iPhones while explaining, in matter-of-fact tones, about a landscape that will hold you or kill you, depending on your scent – where spirit snakes live in the waterways and the dead walk side by side with the living. 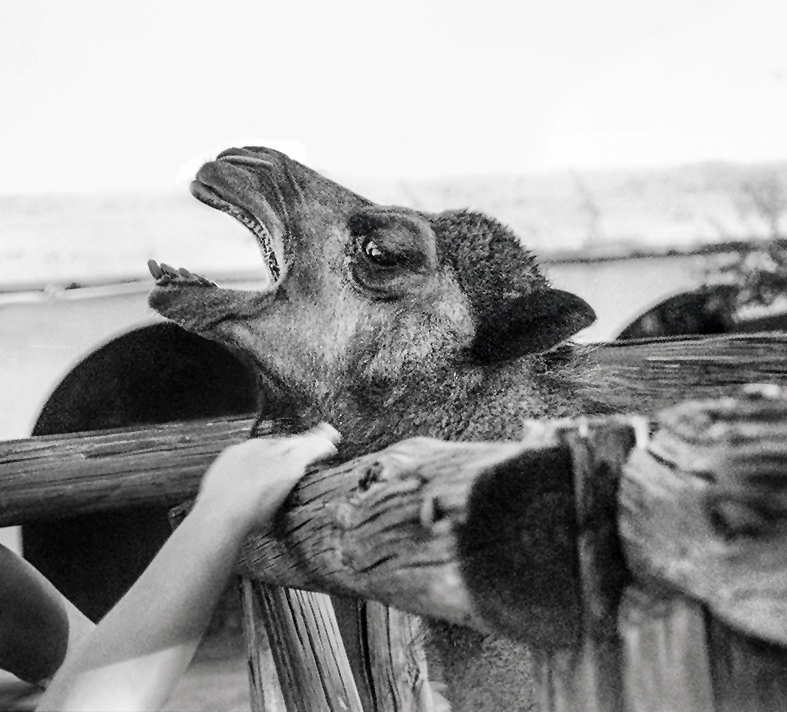 In Lajamanu I lost my fear of dying, and more importantly, I lost my fear of living. This is a book about magic. 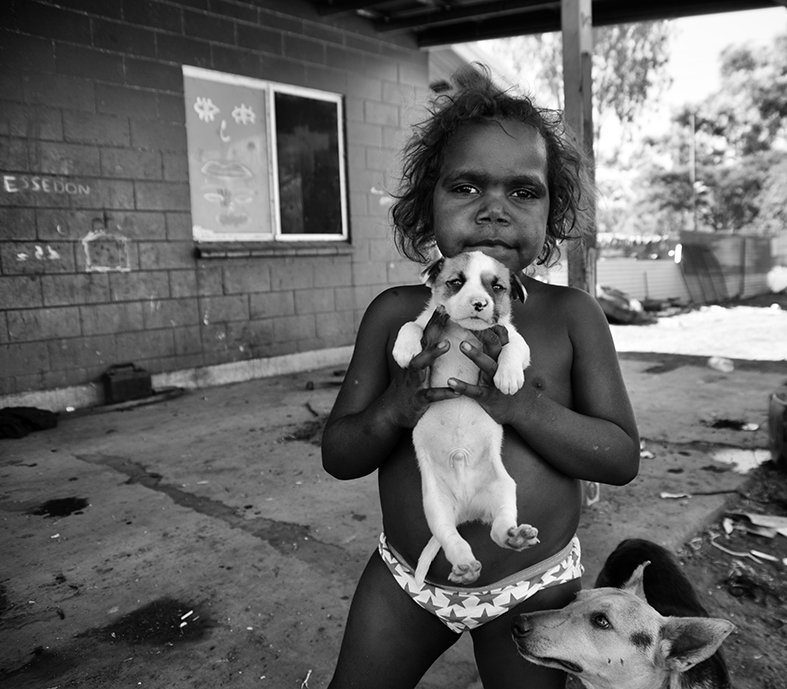 Not the magic of Kabbalists, Theosophists, or conjurers, not Crowley’s magick with a k, nor the magic of the New Age or Western religion – but magic that describes the world hidden inside this world, a world seen only by Aboriginal elders and the dying. This is not a book of photojournalism and makes no attempt to be objective. Quite the contrary, in fact, I wanted this book to be as subjective as possible. 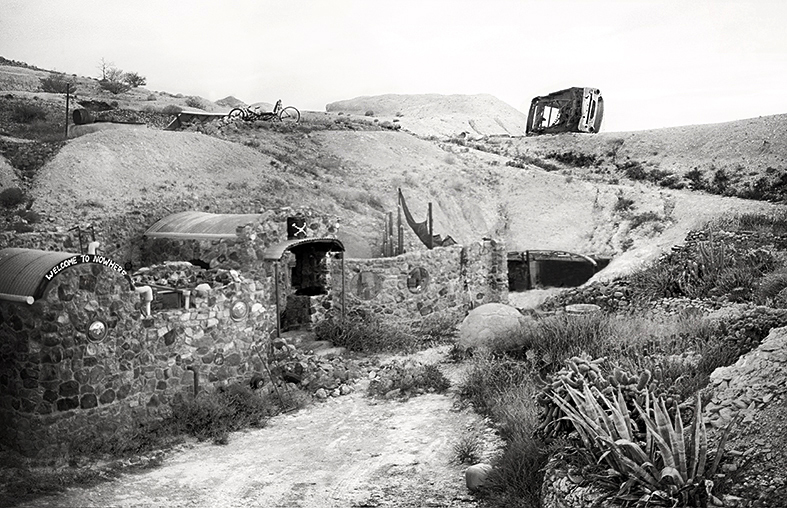 These photographs, especially the portraits, have grown out of my love for this community – the poetry of these often physically fragile people, whose unshakable belief in the deep magic of the landscape gives them a strength rarely evident in the city. 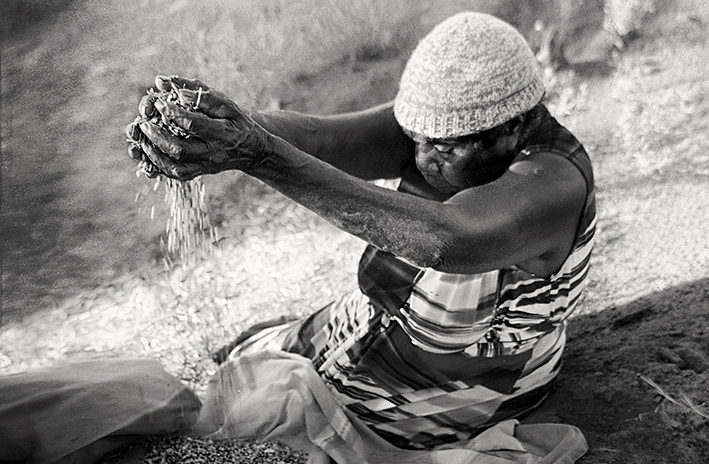 Warlpiri culture is gentle; it leaves no tracks on the earth. 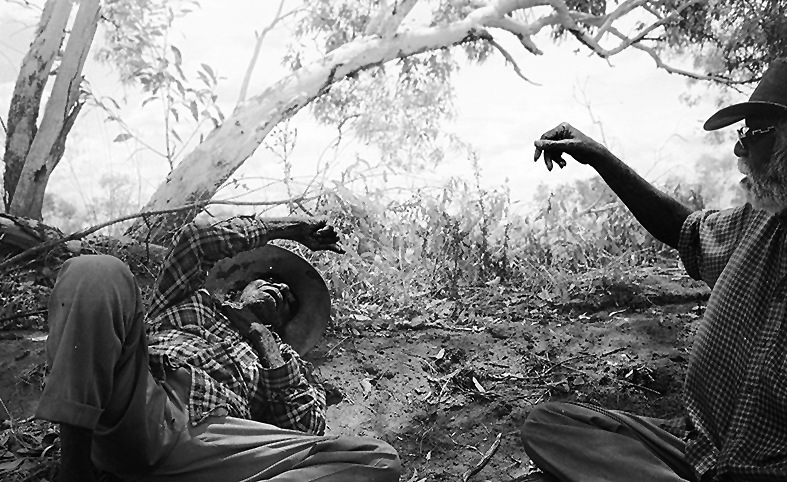 The history of Aboriginal Australia is largely a record of gardening – “cleaning up country” with firestick farming and ceremonies to strengthen trees through song. 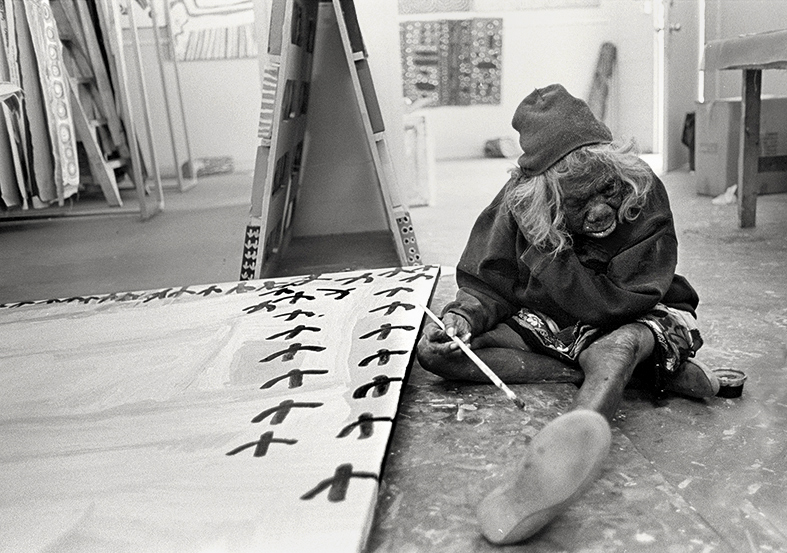 When Warlpiri people move through the landscape, they introduce themselves. They apologise to that country for breaking twigs. They ask permission to take water from the creeks. If humanity ever transcends its selfish and murderous nature, it will be because of people like the Warlpiri. Introduction extract by Judith Crispin pp. 11-13. I know the name in which it came into being. This stretch of highway lies south of the rocket range at Woomera. There are oceans of blood on this land. The Woomera immigration detention centre continued a legacy of suffering that began years earlier, in the 1950s, when Maralinga’s radioactive clouds blew over Woomera, a military township, and killed all the children. aged eight and a half hours. No one has been here for a long time. heading east toward the rocket range. is a grid of air force housing. no one walks a dog. in the Pilbara’s poisoned surf. Country [Gurindji country], hills… well, I put country first… hills, tree, don’t like you – even that water – and that is true. If you drink water from that, or if you not talking to that country because you don’t know, you got no songs with that area… and in the night, or during the day too, you got no language for to try to talk to that country. When God bin put you there, in your country, that’s it. You got a right to live on there. You can get sick alright, but not too much. Yuwayi [yes], you know God? He say, “Yeah you get sick but you’ll be alright,” you know? “I’m with you there,” that God talking. And same thing for our ceremony too. You’re right to use your ceremony. You’re right to sing your own Dreaming song and talking to your country . . . and tell it true – real true. Without the connection between the land and the person, the individual is lost, empty inside, not connected to anyone or anything or the land. If the connection is lost, they won’t survive and their identity no longer exists. Jukurrpa is our life first. Jukurrpa connects us to our country. It is Law that makes it our right to our country. We can’t be sent away. This art center [Warnayaka Arts Center] is for the young people to learn their culture and Law. It is important for our youth to learn the knowledge held by the Ngaliya and Warnayaka peoples. The art center is for the survival of culture from the grandfathers’ and grandmothers’ country. The children are getting lost, and there are not many old men left, some women but few men. 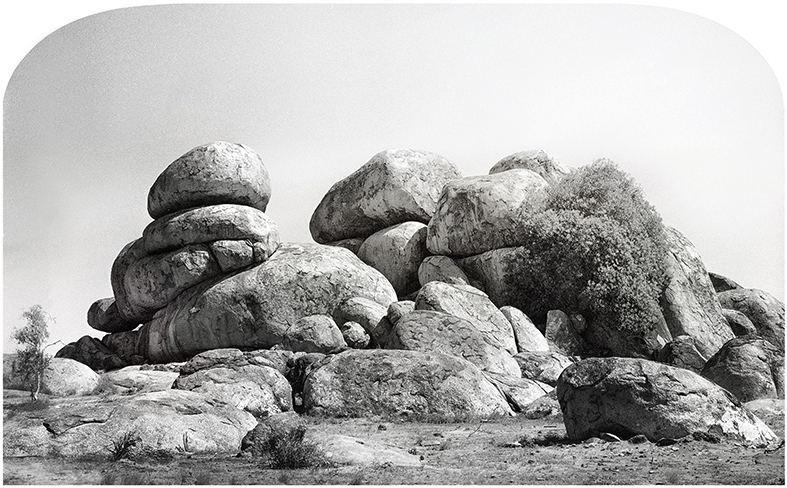 Some of our important Dreaming sites are hundreds of kilometers from Lajamanu. The grandchildren and great-grandchildren who live in Lajamanu need to know their Jukurrpa; otherwise they will lose their inheritance to this really important country. 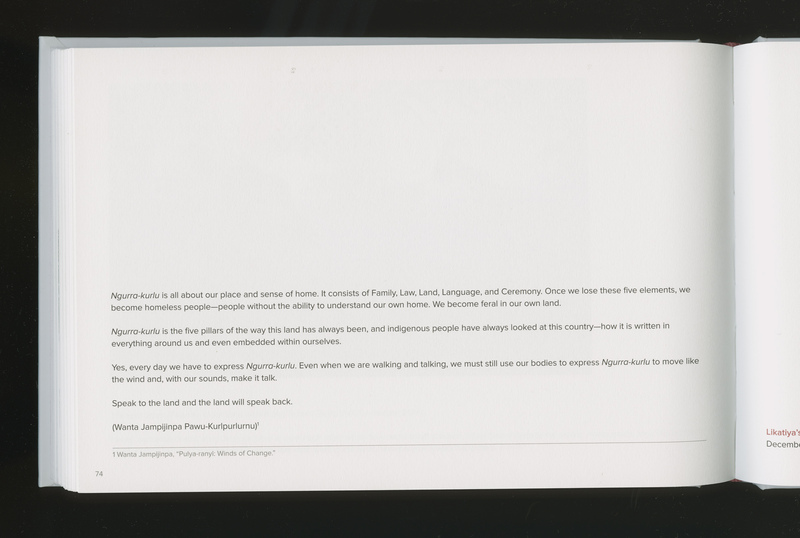 They need to know the Warlpiri Ngalia Laws so they can go onto their great-grandfathers’ and ancestors’ land, especially where these important Dreaming sites are, like at Mina Mina, belonging to the Kana-kurlangu clan. This is why the art center is so important to the people of Lajamanu. 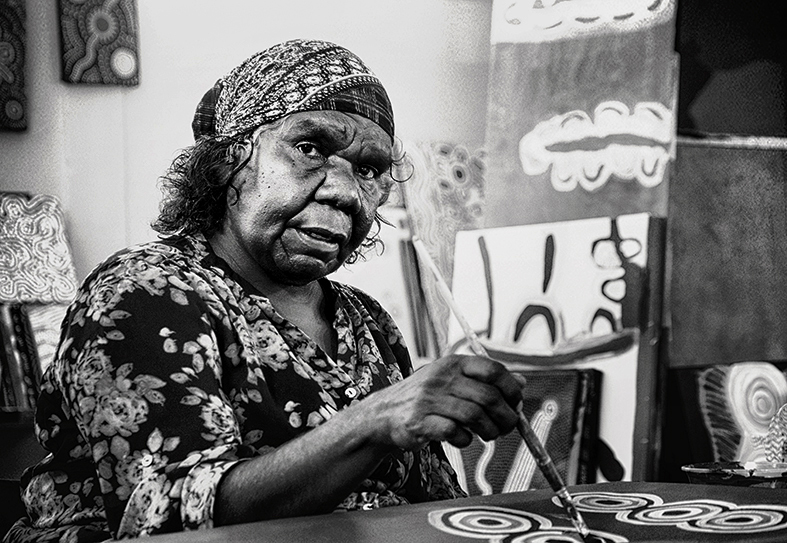 At any time, children can see the works of the elders telling them the Kurdiji, the Law, and all that is tied into the Jukurrpa paintings. This area here, no river. It’s the same deal in this country, and so – what do you call it? Soak? [A soakage, or soak, also called a native well, is a source of water in the Australian desert.] You know . . . I’m trying to get that word there. Soak, yeah, you take all right down to find that water, that water make. Sometimes no water, like this time when it’s dry. Look for the water tree. That’s what my father, my grandpa, my great-grandpa, grandmother, they all look for that water tree. Rock holes down. That’s in our country. We can say it today in a Kardiya way, you know? We can say “Lajamanu is my country.” But that not true. It’s not true . . . yuwayi, Nangala. My country is back there . . . my area is back there. In Lajamanu, tin houses edge the street. In the arts center, old ladies paint seed-dreaming. watching ceremony from the 1970s. Everyone in the videos is dead now, except him. But arthritis and cataracts have caged him. the lights are switched off. seal the crater at Wolfe Creek. the angular syllables of displacement. and eyes, eyes in the granite mines. to my country and never come back. 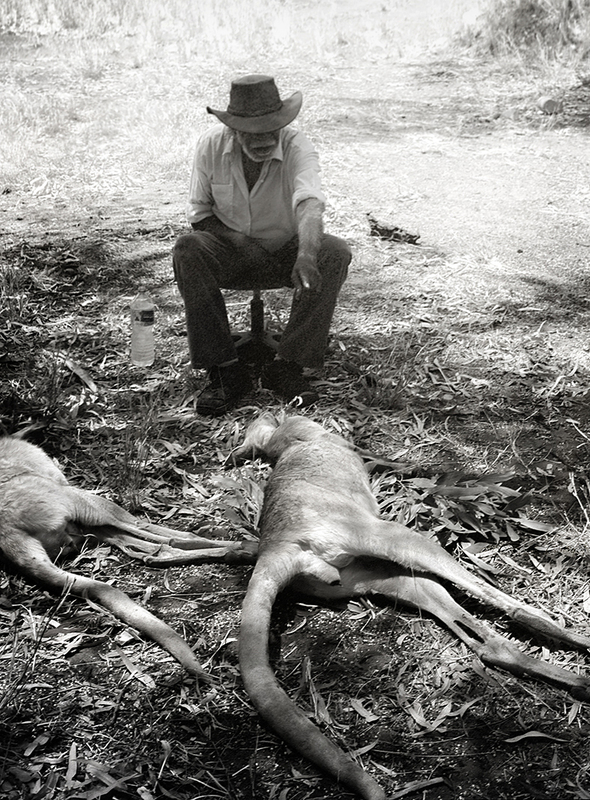 At town’s edge, a kangaroo left by poachers. on Henry’s Ray-Bans, stiffening his white hair to wires. and the last sun rearing. a hunting boomerang beaten on the ground. and to which he belongs. as telephone wires vanishing into the Tanami. I am a beautiful man.